To minimize tax filing hassle and expense, I usually just include the modest income from my kids on our own tax return. But this year, my teen had a nice summer job with a fair amount of withholding. I decided to look into the cheapest, easiest way to file his own tax return, so he could cash in on his refund. As a “starving” college student constantly bumping up against his budget, he could definitely use the extra beer pizza money. 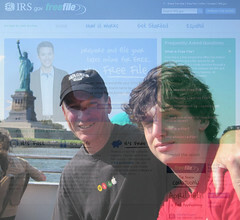 I googled on “file taxes for free” and stumbled upon the IRS Free File Program. It’s a partnership between the government and commercial tax software companies that was created to encourage more Americans to file taxes electronically. Through the partnership, tax prep companies like Intuit offer versions of their online tax filing programs free of charge to eligible filers. The teen with a typical summer or part time job will probably meet the requirements. I’ve been a user and fan of TurboTax for many years, so I was delighted to see that they participate in the program with the TurboTax Freedom Edition. I was able to breeze through the program in about 15 to 20 minutes and file my son’s federal and state returns to collect his refund. Unfortunately, California does not sponsor a Free File Program, so we were dinged $14.95 for the state filing, but that didn’t dip into his refund too much. Nice windfall. That’s a lot of beer pizza! For my son, it was all pizza from the past though — the full $222.05 went toward paying off the loan I gave him for his Spring break road trip. Easy come, easy go. Great article! Teens can really struggle when it comes to filing taxes. There seems to be a lack of encouragement and willingness to do so. There is a great website called teendollars.org that will teach your kids honest money and set them up for success in the future. Thanks Kyle. The online programs like TurboTax really make the process pretty simple for most teen income tax cases - and the IRS Free File Program makes it cheap. Parents should sit down with their teens and go through the process together - great learning experience and demystifies the whole thing.